Before cloud computing existed, data used to reside in individual stores, on different computers, and sometimes within very different ecosystems. Users would have a record for a client in accounting, another in the order entry system, and another in a database of leads. Even emails were hosted on individual machines with only a local access point. To make matters even more complicated, none of these systems would automatically synchronize or intercommunicate; it was a virtual mess! Thankfully many business systems today operate in the cloud allowing users to, for example, pull emails from a customer relationship management (CRM) system (like Copper) and with a single click, dial a contact via RingCentral which logs the interaction for productivity reporting and follow ups. Since data now has the ability to flow freely between software, it doesn't make sense for it to live in individual stores any longer. Think of software integration like bridges in a city, allowing traffic to flow freely from one place to another. Our team at Interlock IT advocates a simplified workflow which eases integration between all of your business systems – phone, email, and software. For instance, allowing calls to be logged in your CRM both in and out of the office, and emails automatically synced to client records in your CRM and accounting software. Our skilled team can perform custom integrations with many other solutions that we may not necessarily resell. Our use of Google App Engine instead of hosted servers and the pervasiveness of modern Open API's with cloud software means integrations are low cost, secure, reliable, and near realtime. Gone are the error prone days of file exports to hard drives and batch import processes that frequently failed due to data structure changes. Modern API's flow through the software business logic layer to prevent issues like posting unbalanced accounting entries. Database or file level integration methods of the past often required duplication of this critical error checking logic and would fall behind as the core software business logic changed. To illustrate an example of cloud integration, we use Hubdoc to automatically push our monthly phone bill to Xero which codes it to the correct expense account. It attaches the pdf image of the invoice and also saves a copy to our Google Drive where we can take advantage of the world's best search engine to instantly find it again. Enabling auto-pay with our provider allows us to simply let Xero's automatic downloading of bank transactions find the matching payment and mark it as paid. There is zero traditional human data entry required, which in return allows us to use that time towards more important tasks like following up with our customers. Unfortunately many businesses still use obsolete (non-cloud) IT software that is inherently inefficient and expensive. Even custom integrations of legacy software is generally designed hastily to fill a need but isn't a permanent fix. This usually involves data that is only accessible from one computer and often by only one user at a time, not remotely and collaboratively. In the era of cloud computing, these sort of 'patch-ups' aren't necessary. Cloud computing has opened the doors for powerful software integrations that yield far superior results when it comes to productivity and efficiency. If there's a cloud application that your business needs to integrate, our team is ready to design and deploy it. Contact us today to find out more about how you can unify your workflow and improve your business IT system! 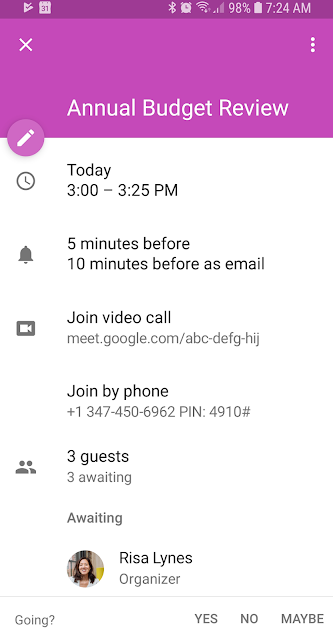 On April 23rd, 2018 Google announced the availability of dial-in phone numbers for Hangouts Meet. Previously this feature was only available with G Suite Enterprise subscriptions for $25 USD/user/month. Enterprise users still get the added benefit of international dial-in numbers and a 50 user versus 25 user per meeting limit. 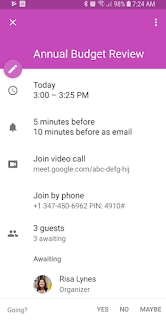 The US based dial-in conference numbers work for all G Suite Basic and Business customers for no additional cost. This is awesome news! We want to highlight that it works great for Canadian organizations too! Most of our customers have flat rate long distance plans in North America so a US based dial-in number is typically of no concern. If you haven't yet tried Hangouts Meet you're missing out. It's far superior to Skype and even superior to most expensive commercial video conferencing solutions. You can equip your boardroom for high quality video conferencing with Google Hangouts Meet Hardware. As always feel free to contact us at Interlockit.com with any questions! G Suite Calendar Interop: share free/busy data between G Suite and Office 365! Google has recently released a new version of Calendar Interop which includes the much-anticipated support for Office 365. In light of this--as well as the old version being deprecated--we have run into a few clients that found the available instructions a bit hard to follow. That's where Interlockit.com comes in to save the day! We're getting straight into the technical details in this post, so put on your geek face and pour yourself a fresh coffee before jumping in. Access to a G Suite Super Admin account. Access to an Office 365 Global Admin account. One spare G Suite license to use as a role account. You will need to know how to connect to Exchange Online Powershell and run simple powershell commands. Users must not have matching accounts in both G Suite and Office 365; both systems will prioritize internal users and ignore Calendar Interop if an internal user is found during lookup. In order to facilitate sharing of calendar information between your G Suite and Office 365 tenant, a role account must exist on each side. Sign into your Google Admin Console and go to the Users section. Configure a new regular user account (no admin privileges) with an email address of your choosing. I recommend “interop@yourgsuitedomain.com”. It is recommended this account be used exclusively for calendar interop. Go ahead and set a permanent password right away and keep it ins a safe place. We will need to log in to this account to complete steps later in this guide. *tip: leave the Admin Console open until you have completed this guide, as you will need it in following steps. The name can be anything, so be descriptive. This email address must not exist in Office 365 as a user or contact. The role account shouldn’t need to receive mail, so it doesn’t really matter what address you use here. This email address must use an accepted domain in Office 365. This address will not accept mail, but behaves like the user ID for the role account on your tenant. Set any password you like. It must be within ‘single-quotes’. *tip: leave Powershell open until you have completed this guide, as you will need it in following steps. Make sure you use the same name in quotes used when first setting up the Office 365 role account. Scroll down and expand the “Calendar Interop Management” section. Enter the Exchange role account’s user ID (in our case, interop@your365domain.com). Enter the Exchange role account’s password. Check the box for “Enable user availability lookups”. When prompted, sign in with the G Suite role account you created earlier. It will ask for permission to access calendar data. Click “Allow”. Click “Download”, and save the credentials.dat file somewhere safe--you will not be able to retrieve this file again in the future without breaking the setup, requiring you to repeat all the steps in this section. Click “Choose File” and select the credentials.dat file you downloaded in an earlier step. Enter your G Suite domain in the field asking which address space you wish to add to exchange. In this example we are using “yourgsuitedomain.com”. Copy-paste the above section of green text into Exchange Online Powershell. You may need to hit “Enter” once each command completes, until all the commands have been run. You can add contacts manually in the Office 365 Admin center under the “Users > Contacts” section. You can use Exchange Online powershell to do bulk updates of contacts if needed. Now you can create a test event in a G Suite user account and an Office 365 user account respectively, to test that each are able to see the free/busy indicator of the other. *tip: it may take a few hours for the Exchange Online settings in Office 365 to propagate, so if your initial tests don’t work, wait a few hours and try again before taking troubleshooting measures. Google provides a Troubleshooting tool but it is limited in functionality. If you get lost, give me a shout over at Interlockit.com and we'll get you sorted in no time! Now, don't you feel like you deserve another coffee? Copper customers frequently ask us about setting up web forms that will automatically create a person (or lead) record and send a personalized email response upon submission. Copper has posted a solution based on Wufoo and Zapier but it doesn't send an automatic email reply. It's also simpler and cheaper to use free Google Forms plus free Mailchimp, so we built it! We loved this solution so much, we opted to use it on our own website. If the email address is found the phone number submitted is compared and updated if needed. In both cases a Copper CRM Task is created to followup and is assigned to the user of your choice, plus Mailchimp sends a personalized welcome email. You can even use Mailchimp to schedule automatic follow-ups, which is what we did for our Blink Reports Software Free Trial Sign-ups. This is another Google form we integrated to Copper CRM and to our Blink Reports for Xero Accounting software running in Python on Google App Engine/Google Cloud Platform. Mailchimp handles DRIP marketing to our free trial signups with a scheduled series of helpful emails. In the case of the Contact Us Form 100% of the code runs inside the Google Cloud using Google Apps Script. The benefits are speed, simplicity, reliability, and security. It's all managed by Google's massive Cloud Computing resources and the world's best security team. All security for editing the online form and reviewing past form submissions in Google Sheets is managed by your existing Google Account logins. It's FREE if we can become your G Suite license Reseller for 10 or more users, which is at no additional cost to you. Certainly reach out to us at http://www.interlockit.com/Home/contact-us to sign up or send us any questions you may have! As we discussed in our prior post Google Drive Backup and Sync plus Google Drive Streaming both work great with your Google G Suite for Business account. In this post we'll show you how to backup your documents folder, Quicken files, photos and videos with Google Drive. Google Drive Backup and Sync can both Backup and Sync files to your computer but we recommend turning off the Sync feature and using Google Drive Streaming with your G Suite account. This avoids the consumption of hard drive space and the security risks of storing files locally on your computer. Download Drive Back and Sync here: https://www.google.com/drive/download/backup-and-sync/ and run the executable to start the installation. During the initial setup choose the folders you would like to backup, but don't turn on Drive Sync. Note that we've chosen to backup various folders from the Home Theatre PC (HTPC) including my kid's local user directories where their valuable Minecraft levels are saved. We've also enabled the uploading of photos and videos to Google Photos. This way any new photos saved to the selected folders on the local drive from my Sony camera are automatically stored in Google Photos and accessible from any device anywhere, anytime. You can choose Original quality or the free unlimited High quality mode. Note the "Removing items" option. If you want files you delete in Google Drive from the cloud or from the local computer to be deleted everywhere without prompting then choose "Remove items everywhere". You can also be prompted to remove items or you can choose not to delete items on other devices which may leave lots of orphaned files behind. If you have a large amount of data to backup the initial backup could take many days to complete but once finished it will only upload the changes as they occur. If your G Suite license is for G Suite Basic ($5/user/month) you can store up to 30 GB of files, photos (original quality), and emails. Upgrading to G Suite for Business will give you Unlimited storage for $10/user/month (1 TB/user if 5 or less users on the domain). G Suite for Business at $10/user/month is one of the most cost effective unlimited storage options available since it includes the full G Suite of software, Google Vault and more in the price. 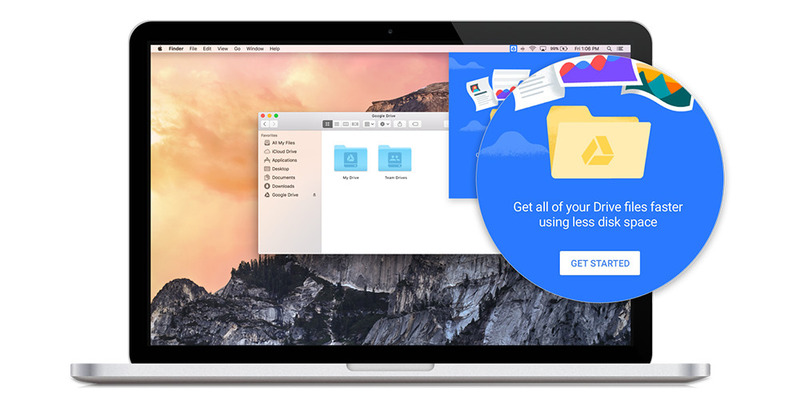 Dropbox charges $10/user/month for 1 TB of storage but it does not include email, calendar, Google Docs, Google Meet video conferencing, Google Sites, etc. Google Drive Backup and Sync is also an excellent replacement to Crashplan who exited the consumer backup space this year. Certainly contact us at Interlockit.com for assistance or to upgrade to G Suite Unlimited storage!